Sebaceous glands are attached to hair follicles in the skin on the face, neck, back, and chest. They produce an oily substance called sebum, which normally reaches the skin surface through the opening of the follicle (pore). When follicles become plugged, sebum cannot reach the surface of the skin. This blocked sebum promotes the growth of bacteria (Propionibacterium acnes, or P. acnes) beneath the skin, which in turn produce chemicals and enzymes that attract white blood cells, causing inflammation. Eventually, the follicle wall breaks down and the sebum, skin cells and bacteria erupt to form lesions or pimples. These are the visible effects of acne. Rosacea is a chronic skin disease that causes redness and swelling on the face. The scalp, neck, ears, chest, back and/or eyes may also be affected. 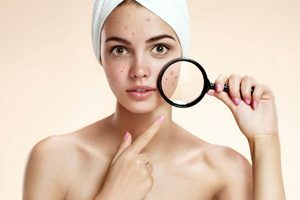 Symptoms range from red pimples, lines, and visible blood vessels to dry or burning skin and a tendency to flush easily. Many people find that the emotional effects of rosacea – such as low self-confidence and avoidance of social situations – are more difficult to handle than the physical ones. 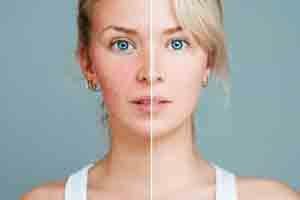 Although it can affect anyone, rosacea typically appears in light-skinned, light-haired adults aged 30-50. It is not yet known what causes rosacea and the disease is not curable, although it can be treated with topical and oral medications, laser therapy or laser surgery.